The few own the many because they possess the means of livelihood of all … The country is governed for the richest, for the corporations, the bankers, the land speculators, and for the exploiters of labor. 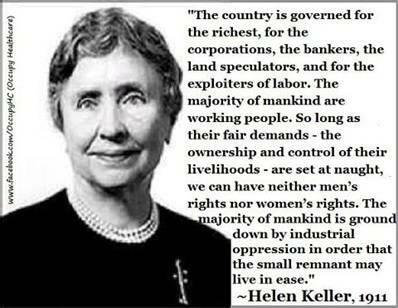 The majority of mankind are working people. So long as their fair demands – the ownership and control of their livelihoods – are set at naught, we can have neither men’s rights nor women’s rights. The majority of mankind is ground down by industrial oppression in order that the small remnant may live in ease.